There’s still one vote to go and a full twenty-four hours before full onset Lent Madness Withdrawal (LMW) sets in! So make this one count as Roch faces Julian of Norwich. Will this battle go to the dogs? Or will all manner of things be well? To get to this round, Roch defeated Gertrude while Julian snuck past William Wilberforce. The winner will face Albert Schweitzer in the Elate Eight. While yesterday, Sojourner (Nothing but the) Truth slammed the door shut on Frances Joseph Gaudet 67% to 33%. After a full week of Saintly Sixteen action, we have just two more slots up for grabs in the Elate Eight. Today’s battle will decide one of them and on Monday the last matchup of this round will see Dietrich Bonhoeffer take on Barnabas. The field is narrowing as the chase for the coveted Golden Halo continues. On the day that Roch/Rocco/Roque snuck by Gertrude for the win, our house was infected with a modern plague: the flu. As we lay weeping and gnashing our own teeth and shamelessly wanting our mommy (this is the 40-year-old talking), our dog got out and was attacked by another animal. In the midst of the plague, my dog needed surgery for five puncture wounds and as I write, he lays at my feet, recovering. He is a good dog. For a saint that I did not know well going into Lent Madness, Roch seems to be having a rather profound impact on my house in big ways. I cannot help but reflect on the irony of lifting Roch up in the blogging world as plagues and an injured dog infiltrate my world. Such is life. However, this post is not about me, it is about the quirks and quotes of St. Roch. As I read the MANY comments following Roch vs. Gertrude, several made me laugh–it seems as though a number of readers were deeply appreciative of Roch’s well-formed thigh and dashing pose. Alas, while Roch may look like he is attempting a Calvin Klein bid, in truth the artists of the times display his shapely thigh to show the plague scars. Being unashamed to show the ravages of his disease was an expression of being intimate with the suffering of Christ. Enduring disease and infirmity were seen as a path to martyrdom. The people saw a seemingly healthy individual, albeit scared, as a promise for curing of their own illnesses and disease. Here was proof of God’s healing grace in the world. Lest you think invoking Roch will only ward off illness and disease, his name has also been invoked to ward off vampire attacks. As an anchoress in medieval England, Julian of Norwich got to do something most of us only dream of—she went to her own funeral! The occasion of her being sealed into her cell would have been marked with a momentous liturgy, including a vigil, mass, chanting, and a procession to the anchorage, concluding with a funeral service where Julian would have received the last rites, both symbolic of her death to the world, and pragmatic, since a priest would not be permitted to enter the cell later. The only thing that prevented her complete isolation from the world were three windows in her cell. One, called the Squint, opened into the church so she could receive communion and follow the services. The second allowed her attendant to deliver food and empty the chamber pot. The third window provided visitors a way to talk to Julian, and if I had been alive then, I certainly would have wanted to! In one of her visions, she described seeing a tiny thing in God’s hand, the size of a hazelnut, and understood it was the whole of God’s creation. It seemed so fragile to her that she asked how it could survive. She was told that everything that exists has its being through the love of God. 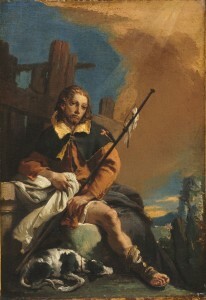 Roch: Giovanni Battista Tiepolo, Italian (Venice, Italy 1696 – 1770 Madrid, Spain) Julian of Norwich. 151 Comments to "Roch vs. Julian of Norwich"
Julian. Because she saw that we are all God’s small brown nuts. The Incarnation is both beautiful and funny. And Lent is a great season. As much as I admire Roch and his suffering, I think Julian of Norwich has my vote. We may look to Roch in times of pestilence, but I like the idea of martyrdom. My winter has been spent suffering from one thing or another and being an RC, we go for marytyrs. If only I had the good deeds plus my winter martyrdom I would be a shoo in for a heavenly reward. Alas I will just wallow in self pity and hope in the Resurrection this Easter. Julian is such an inspiration. talk about Lent being funny – this just cracked me up! I love being one of God’s small brown nuts. Julian it is. Heave I mentioned that for the first time EVER, I hate Friday? I suffer through what seems like an interminable weekend, sorrow, loneliness from my LentMadness. This does need a “like” button! I voted for Julian because she world in God’s hands. Oliver, I can picture you now when I read your comments! So cool! That is exactly why I voted for Julian, Oliver!! Isn’t this another cats vs. dogs match up since some icons of Julian have her petting a cat, the totem of all contemplative creatures? I’ve been told the cat kept the vermin at bay! I smell what the Roch is cooking. Julian, of course. Believing each day that all will be well. Julian also for me, and all will be well. Gee, I must be up early if there’s only one comment so far. I am practicing for Daylight Savings Time. Losing that hour of sleep is always so difficult. Oh, and I voted for Julian also so, so far, she has a landslide. I am sure Roch would rejoice in the victory of his sister, humbly unnamed though we call her Lady Julian. As he showed his contemporaries God’s love by being willing to show his scars, she opened a window of hope in that transforming, all-sustaining love by her writings that remains open today. She saw us as the little nuts we are–love St Celia’s comment. I hope she wins the Golden Halo, and pray that we all find our perfect place and perfect means to do those good works prepared for us to walk in! I voted for Julian because she lived in the town where my mother was born and grew up–Norwich. Also, I appreciate her seeing “sin” as a way or the way to know God’s love. Julian because after reading about her my first reaction was that I would have liked to meet her. Maybe Julian had a psychological problem to want to be sealed in a cell? That’s very selfish. Yes, Julian was sealed in a cell, but she had that window, through which she ministered to the world. Sometimes you feel like a nut…Julian. Has to be Lady Julian. Her writings are still fresh to me and speak of a God in love with the world. Julian because it seems like we could all use a little more mystical hope. I’m with you on this one! We could certainly use a sense that all shall be well … even if the debaters behaved last night, I, a confessed political junky, find myself quite unsure, but grateful that Julian assures us otherwise. Roch all the way. He wss a saint out in the world, which I value more than one who chose to withdraw from the world. Also I love dogs and appreciate suffering. Great posts about both saints. Totally agree! Although I am more of a “cat person”, I appreciate that if you are loved by a dog, you are special. I’m with you, Sue and Wramps. I know I’m backing a loser, again, but that’s the way it goes! Why are you not backing he/she whom you want to back not “winner” or “loser”? I went with Roch because he’s the patron saint of dogs. My dog has been quite ill and needs all the help she can get. Hopefully, St. Roch will help. Voting for Julian today for her insight and commitment and because today, being walled up in a church sounds rather attractive. I voted for Roch because he has no hope of winning and I loved his writeup. I’d have loved Roch’s writeup better if it had been competently proofread. As it is, I hope the dog is healing well while LYING at its mistress’ feet and Roch was more scarred than scared. But then I’ve loved Julian for decades. Hope all is household now healthy. Better to be out in the world then locked in a cell. Julian has my vote today. She left so many writings that have inspired people for a long time, thus having quite some influence out in the world. Next time she comes up may be a harder decision. I thought briefly of voting for St. Roch, he of the shapely thigh, but in the end had to go with St. Julian, if only for the tasty hazelnut bread I made in her honor. Also, I would have loved to talk to her myself. The life of an anchorite interests me. Onward, Julian! I am slightly ashamed that I didn’t even read today’s info. I saw Julian and clicked. I love everything about her. Rocco is amazing, but he ain’t no Julian. I am going to have to vote for Roch here. I definitely consider him more o a role model. Yes! I think Julian’s big lead is only because in Rocco’s real world worn state people don’t recognize him yet for who he is. Once they do, I think he’ll make a miraculous COMEBACK! Let’s set aside our inner mystic appreciation of Julian’s writings and vote for the saint whose life would clearly make a better movie!! Thanks to both bloggers for their excellent write-ups today. I appreciate especially the attention to historical context which can help take us out of our own often narrow contemporary worldviews and enter into the life and thought of other times and places. Really well done! I think I will cast an appreciative vote for Roch today; my dog has completely recovered from “old dog vestibular syndrome” that had him staggering around and falling down a couple of weeks ago. I voted for Roch last time, hoping that healing could also go from man to dog, and I certainly owe him one. Thanks, Roch! Also because Julian clearly doesn’t need my vote this round, which means I’ll get to vote for her again a couple more times. Julian for the Halo! Although I have long been a fan of Julian, today my vote was for Roch in honor of all the dogs I’ve known over the years who have been my Faithful Friends and eyes Into the Heart of God. Although my heart says Julian, I love the personal touch Anna Fitch Courie gave in her writing about Roch. Thank you, Celebrity Bloggers! The world needs more protection from the zombie apocalypse! Go Roch! Hold on now, I think we have some theological confusion here! Vampires and zombies are not the same thing. Roch is protecting us from the blood suckers, but is he in charge of the rotting folk as well? Roch is an all inclusive protector. Yes, that is good to know. If I recall correctly, the zombie apocalypse on “The Walking Dead” started from a flu/virus. Roch on! I had to vote for St Roch! I am at the doctor’s office being pumped full antibiotics intravenously as I am reading this blog. St Roch is now my Saint to pray to for healing grace! Perfect timing. 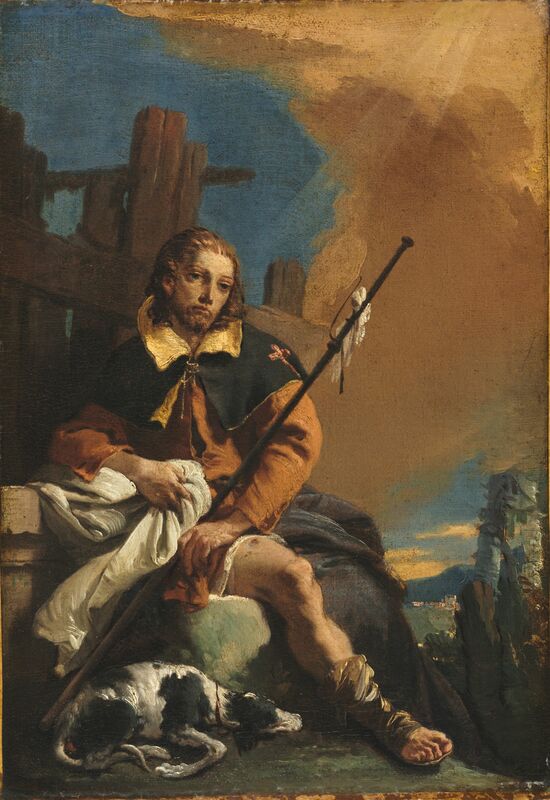 St. Roch, pray for us and keep us well. Long before its source, I knew the lines “All shall be well, and all manner of thing shall be well” from T.S. Eliot’s “Little Gidding.” What beautiful words taken from Julian’s “and by this deed he shall makes all things well.” Julian’s end-time view 0f mystical hope is what got my vote. Kudos to both celebrity blogger’s today! They truly understand quirks and quotes. But Julian gets my vote–so reassuring to have hope for the end times and assertions of one’s goodness and worthiness of God’s love, even with that sin thing going on. Whole-heartedly agree! Anna, your post on Roch was so GREAT. Even though I have a wretched cold and am currently traveling close to vampire country, and I should therefore vote for Roch as a means of protection, I’m going with Julian because of her optimistic visions and her belief in the power of positive thinking. In John Steakley’s vampire novels, there’s a part of Dallas in which the head vampire lives. It’s a beautiful, very affluent area, probably because, according to Anne Rice if I remember correctly, vampires have a long time to let their investments grow. I used to enjoy driving through vampire country on my way to work. Nevertheless, Julian got my vote because of her positive outlook overall. Nothing against Roch, but I was glad to get a second chance to vote for Julian. I am a big fan of Wilberforce so I voted for him last time. Being the patron saint of dogs and plagues is tempting, but even with the extra bonus of warding off vampires, I just don’t see that much about Roch when compared to Julian…or whoever she was. Both write ups made me cheer for the saint. Roch for wearing your scars as a sign of hope and proof of God’s healing love in the world, and Julian for the image of God holding all of creation like a hazelnut in a hand. I’ve got to go with mystical hope…so sorely needed in today’s world! Maybe, but don’t we also sorely need someone to touch us where we are plagued? The ‘apologia’ for Roch above was so compelling, it almost made me change my mind and vote for him rather than for Julian – well done!!! After doing research on Rock, I had to cast my vote for him because being in the world filled with its plagues and enemies requires so much more courage than sealing the world out. PS Is there a patron saint of rock and roll? Roch/Rocco/Rock seems a great candidate! I agree, maybe St. Roch would be a good candidate for a patron saint of rock and roll. (Or should I say Roch ‘n’ Roll?) Perhaps the Standing Committee on Music and Liturgy could do something about this? Keep on Roch-ing!! Voted for Julian, because we need a word of hope. Roch was surely scarred not scared, but Lord knows we need some more hope-filled voices today. Julian, hands down. This far into Lent, I need all the positive perspective I can get. I wish Anna and her household complete recovery, but for me, all shall be Julian.. This choice comes at no small cost to those of us who love puns and have a Pavlovian response to the kitsch possibilities of Roching on. But as others have said, I would love to meet Julian. (Maggie Smith would play her in the movie.) Her beautiful spirit and ageless wisdom and endless love move to me say: All the way with Lady J! The Dame got game! Peg S., I agree with your choice of Maggie Smith to play the Lady Julian. If not Maggie, perhaps Meryl Streep? Meryl is also a good choice. But Maggie has eyes “like a candle set in the windows of a house bidding the wanderer to come in out of the storm,” as an old blessing says. Perfect for Julian. I too thought of voting for the underdog Roch today because of the delightful bio and the reference to the Zombie Apocalypse, which my middle son often teases me with. If I ever get another dog, I will name him (or her) Rocco. When I visited Mother Julian’s church in Norwich recently there was a beautiful white cat sitting under a tree in the churchyard – definitely a sign. Poor Rocco. Is it even a contest? Rocco has no chance against Julian, so I cast my lot (or vote) with him. In the description of the painting of Roch, did you mean scarred (with a scar) or scared (frightened)? Don’t you just love Lent Madness? It’s incredible how much I’ve learned about all these lovely saints. Today’s match-up is unfair, SEC! I’m so torn between Roch and Julian and am drawn to both. 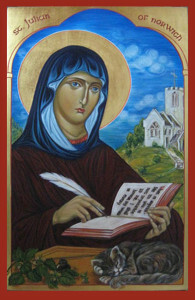 Alas, I must choose Julian of Norwich. Her optimistic view of mystical hope won me over. Great job writing, Amber and Anna! I identify more with saints who carry out their good works in the world where the people who suffer need healing from one who has known pain and suffering and has healing scars as proof. Julian will sweep the boards today but I don’t relate as well to those who isolate themselves behind a visible barrier from those who need hands on healing. Reading the words of a saint is inspiring but not always enough to heal what ails. So much visionary blogging today …..maybe from the flu meds and a vision or two ! Don’t forget that there was a third window, where people could visit and talk to Lady Julian. The “talking cure” can be immensely healing, too…. Three windows — wow what an abundance of air and light. I hope you have not had the flu. If you did, I hope it is long gone. I voted for Julian because (1) “Little Gidding” and (2) I have to vote for my namesake! I hope I was not influenced by the fact the Roch story used lay instead of lie, but do think grammar is an important part of communication and here is an example. Really I like being a small brown nut. Julian, of course, because she saw that God is the goodness that cannot be angry, and that Jesus feeds us like a mother. Roch. It was Julian’s chamber pot that lost my vote. Please think about the consequences of Julian’s not having a chamber pot to empty. Chamber pots were a feature of one house I lived in in rural Vermont after WW II, and Julian lived at a time when indoor plumbing was confined to England’s 1%. Also, please disregard this comment if you were joking. Actually I was relieved to learn about the chamber pot. It did answer some questions not usually asked in polite society. Must support my beloved patron saint! Her words have many times kept me from total despair in grief. She would be the perfect one to win the Golden Halo this year! We so much need her positive loving view of God and his care for us. Oliver has it right. The world in God’s hands does it for me. Thank you Amber for such a beautiful synopsis of Julian in a crystal clear nutshell. All shall be well has new depth of meaning. Roch’s willingness to expose his scars as a symbol of hope is profound, but Julian’s sense that through God “all shall be well and all manner of thing shall be well” carries this day for me. Julian, fare FORWARD this DAY (note shameless promotion of SEC’s sponsoring organization). Always loved Julian. Her response to the hazelnut reminds me of William Blake ‘to see heaven in a wildflower and eternity in a grain of sand’. Julian for me. I am loathe to wager, but if I were a betting man, my bet is on Sojourner Truth to win the Golden Halo. I once had a very good record at the race track, by the way. Haha! Have you been looking at my bracket?! For me this day, it’s Julian all the way! We can learn much about God and the faith from the legends of saints like Roch, but Julian teaches us by her own amazing writings about the love and mercy of God. Besides, I have made a pilgrimage to the shrine church of St. Julian in Norwich and have made retreats at the monastery of St. Julian in Wisconsin. Thus I must vote for Julian. At the same time I pray that both Anna and her dog have a happy issue out of all their afflictions, and that, for the sake of the English prose of which Julian was a pioneer, her dog “lies” faithfully and comfortingly at her feet. thanks for the video, Kim. Made me smile. Go Roch (and Lady Julian too). Hard choice. Julian …for she saw our world for what it surely is…a small but well loved thing in God ‘s enormous universe. In honor of Roch, another dog video. This one has twist at the end that is hilarious! It’s great! We used to take our little old dachshund for a ride to the ice cream store and order her a dish of non-fat vanilla. I can’t believe it!! Yet once again…how many days in a row is it now…I’ve voted for the one who lost; I must be the world’s greatest champion of the underdog! With all due respect, and great respect, to Julian, that poor soul did seem to show symptoms of mental instability; who would want to be walled up in a cell? roch, even though suffering, was right out there in the world, he and his faithful dog, interacting with others, exhibiting his scars…shapely legs or not…to give hope to others. Although he is sadly no longer in the running, I think he is awesome! Don’t you believe in miraculous comebacks? Good grief, not even Rubio has given up yet. Let’s go Rocco!! Come, on West Coast dog lovers, you can do it for him! This small brown nut of a man pictures himself in the hand of God, and trusts along with Julian that “all manner of thing will be well”. Let it be known, Julian is on my bracket for the Golden Halo so secretly I want her to win the day; but I voted for Roch because this is Day Seven of the Plague for me, personally, and half the office staff (there is talk of germ warfare being waged the healthy ones.) Gotta hang with the sickies. Misery loves company. After Roch’s initial victory, our Beagle, Duke, became seriously ill. My husband said he was praying to a St Rock. I referred him to the bracket poster (he isn’t playing Madness). While Dukey left to chase rabbits in paradise, Roch helped ease our great, great sadness. I had to come back. I became so engrossed with the cats and dogs that I forgot to vote. I always enjoy the discussion, but the videos were terrific. Roch–a wounded healer, visible scars. He was also a living witness that no curse uttered by a person, such as “A pox on you!,” can overcome the love of God. At the last moment, I went with Roch, despite knowing many wonderful things about Julian. It was the dogs that got me, as I feel like a patron saint of dogs sometimes myself. I’m on my 4th rescue dog, 2 of the others having lasted a short time. Having a dog is a really good thing, if sometimes trying. I’ll always go for the mystic over the martyr. Team Julian for me! Dear Anna, I hope you and your family and dear dog heal quickly. Please feel the love to you from the lent madness community…. even from Australia! Thank you! This made my day! We are getting there! I really love Julian because she stayed anchored at the church. while I would not like being in a cell with only three windows, I do stay anchored in the same place. I hope I can make a difference where I am. Julian will probably win, so I am voting for Roch because dogs are wonderful judges of character. You can’t fool a dog. I have to vote for Roch today – its my husband’s middle name (though being of Croatian descent he spells it Rok.) Any other time Julian gets my vote! I have a wondeful pup missing, Wilhelmina. She was hit not long ago, but she was getting better and better even with a bad hip. I had to vote for Roch again today. He can ward off vampires! But there is only one real Rock, and he wrestles with the Devil and always wins for us. May Wilhemina be on the way back to you right now. I voted for Roch because he’s the underdog here, and because there’s something about his life story that strikes me as both beautiful and profoundly sad. But I’ll be happy to see Julian win. I’ve been fond of her ever since I first “met” her when I was a teenager, in the historical novel “Katherine” by Anya Seton. Julian plays a crucial role in the later part of the novel. Seton did her homework and took her portrayal of Julian’s teachings and sunny personality straight from Julian’s works. I, too, first “met” Lady Julian in the historical novel “Katherine”. I have read and reread it, and commend all of Seton’s works because of her extensive research. I have learned so much from her writing. While it may result in a contemplative life, I cannot see the benefit to humanity of locking oneself away. Roch gets my vote, though it is obvious that I, as usual, have chosen to back the wrong saint. Not the wrong saint, just the saint that probably will not get the most votes. Roch is a right saint. So is Julian. Both for different reasons. Hey, folks, he’s only 3.500 votes behind and there are over 2 hrs. left. Let’s go Rocco! How can people be so blind? I’m really worried about all the weeping and gnashing of teeth that’s gonna go on once people recognize Roch for who he is: a true golden halo saint! Are we really gonna make him sit for 5 years in LM Limbo until he’s eligible again? Julian gets my vote today. I like the nut analogy. The more I read Julian’s words the more I would have loved to meet her. I’m surprised by some of the negative comments about Julian’s anchorite status. Folks know she was hardly the only person to do this, right? It was a legitimate form of religious life that combined the solitude of the traditional hermitic lifestyle with participation in a church community, as well as presenting a powerful symbol of dying to self and to the world. Like some of the Stylites of an earlier era, the anchorites dramatically withdrew from the world to devote themselves to prayer, but in a way that kept them available as sources of wisdom and counsel. The sign outside the church that gave some history described Roch as the original “Doctor Without Borders”, a memorable description. And in almost every single church I visited, there was some side chapel or some section of a wall where people had plaques mounted in memory or petition or thanksgiving (rather like putting in a personal ad to that purpose in a religious publication, I suppose); and a significant number of them said “Thank you St Roch.” I was very impressed, as I’d never heard of this saint before! but clearly he had a devoted following in at least one place and time. Thanks so much for all the stories–and particular for speaking to the validity of the anchorite’s vocation. Another tough choice, as I am a dog person. But had to go with Julian because I so lover her writings. And also because I can often understand the impulse to hole up away from daily and mundane aggravation. I vote for Julian since I live in the Willamette Valley where we grow “little round things” that include hazelnuts/filberts. Julian. Someone who was so separate from the world yet so present in it, impacting us who live so many years later. LMW and Daylight Savings Time? AAAAAAAAA! Saints preserve us!